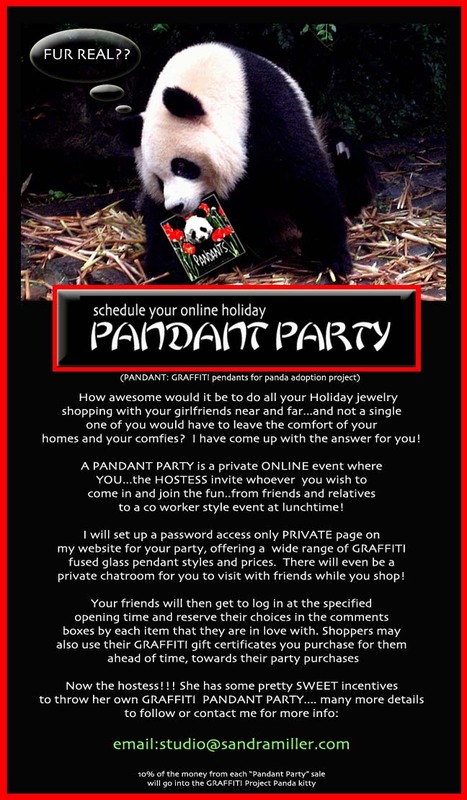 Home STUDIO PANDANT PARTY RESERVATIONS…FILLING UP FAST! PANDANT PARTY RESERVATIONS…FILLING UP FAST! ……VERY LIMITED PARTY DATES ARE STILL AVAILABLE….. SOME OF THE PERKS FOR BOTH YOU THE HOSTESS AND YOUR FRIENDS!! DESIGNS, HOWEVER EACH PENDANT WILL COME WITH A BEAUTIFUL FUSED GLASS MINI PENDANT “GIFT” FOR HELPING ME TOWARDS THE EVENTUAL ADOPTION OF A BABY PANDA IN CHENGDU CHINA!!! I WILL PROVIDE THE HOSTESS WITH AN AWESOME INVITATION TO EMAIL OUT TO HER FRIENDS, FAMILY AND CO WORKERS….NO WORK ON YOUR PART AT ALL! IF YOU PREFER I CAN DO THE MAILING FOR YOU. GIFT CERTIFICATES MAY BE PURCHASED AHEAD OF TIME FOR YOU TO PRESENT TO YOUR FRIENDS TO USE AT THE PARTY….A FUN LAST MINUTE SURPRISE THAT WILL TOTALLY BLOW THEM AWAY! AND WHAT IS A PARTY WITHOUT SURPRISES??? THERE WILL BE IMPROMPTU GIVEAWAYS TOO!! THE MORE ATTENDEES…THE MORE PRIZES !!! !